Product prices and availability are accurate as of 2019-04-11 11:06:12 EDT and are subject to change. Any price and availability information displayed on http://www.amazon.com/ at the time of purchase will apply to the purchase of this product. A MAKE-YOUR-OWN GUIDE FOR HARD-TO-FIND SMALL PARTS! Using this excellent sourcebook as a guide, you can easily make high quality, defect-free castings for almost any purpose ... at amazingly low cost! Just some of the countless uses you'll find for this potentially profitable skill ... making obsolete or vintage car parts, hood ornaments, garden and fireplace tools, kitchen utensils, automotive parts, replacing broken antique parts, reproducing sculpture, plaques, and other art ... all kinds of decorative and useful objects for your own use or to sell! 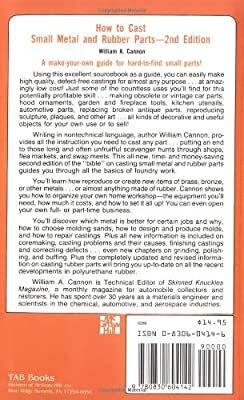 Writing in nontechnical language, author William Cannon provides all the instruction you need to cast any part ... putting an end to those long and often unfruitful scavenger hunts through shops, flea markets, and swap meets. This time- and money-saving second edition of the "bible" on casting small metal and rubber parts guides you through all the basics of foundry work. 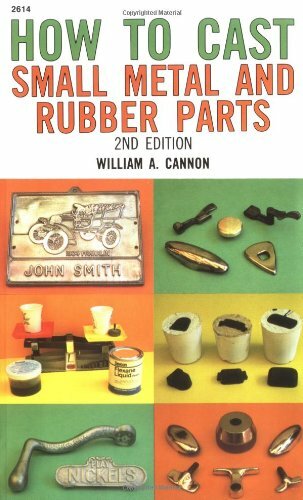 You'll learn how to reproduce or create new items of brass, bronze, or other metals ... or almost anything made of rubber. Cannon shows you how to organize your own home workshop -- the equipment you'll need, how much it costs, and how to set it all up! You can even open your own full- or part-time business. You'll discover which metal is better for certain jobs and why, how to choose molding sands, how to design and produce molds, and how to repair castings. 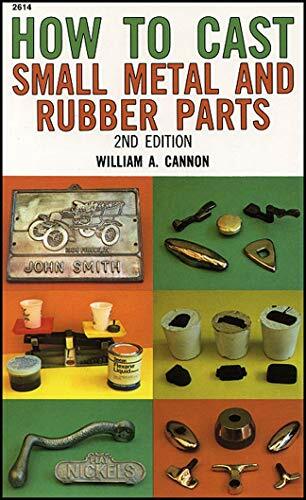 Plus information is included on coremaking, casting problems and their causes, finishing castings and correcting defects ... even chapters on grinding, polishing, and buffing. Plus the completely updated and revised information on casting rubber parts will bring up up-to-date on all the recent developments in polyurethane rubber. Copyright Date: 1986 Edition: 2nd Pages: 168 Binding: Paperback Dimensions: 8.5" x 5.5"